When it comes to web hosting, no two companies are the same. Most users who are in need of a web host aren’t really looking to build a large website, and some of them probably even have limited technical knowledge in programming and other web-related stuff. Knowing this, many web hosting providers aim to offer simple, affordable, and feature-packed hosting packages. There has been a boom in websites in the past few years, and the increase in demand has resulted in an increase in the number of web hosting providers. The problem here is that many of these web hosts do not always have your best interest in mind and are just after your money! Oftentimes, they’ll limit the services included in their cheaper hosting deals and charge much higher rates for their fully featured packages. Some will even deceive you with “cheap monthly rates” but once you add a few extra features and services, it can be much more expensive! Other web hosts are focused on their large clients and will constantly upsell and urge you to upgrade to their VPS or dedicated hosting plans. These offers can be quite confusing to the new website owner who’s just looking to build a simple website. Cutting through all the noise and confusing details is HostMonster, an industry-leading web host that focuses on providing individuals and businesses with simple yet feature-packed hosting packages that provide good value for money. But the thing is, HostMonster is just one of the many hosting companies that offer web hosting solutions in the budget-priced category. So what makes them stand out from the rest? Do they really offer reliable hosting solutions at affordable rates? You’ll find out as you read this HostMonster in-depth review. HostMonster Web Hosting – What’s Their Story? HostMonster has had a strong presence in the web hosting industry for many years. Established in the year 1996, this company has been providing hosting solutions to thousands of personal and commercial websites, serving the needs of those who seek value. HostMonster share a 50,000 square foot data center with sister company, BlueHost, in Provo, Utah. With years of experience and expertise in the field, the company has racked up a large customer base, resulting in over a million client websites. 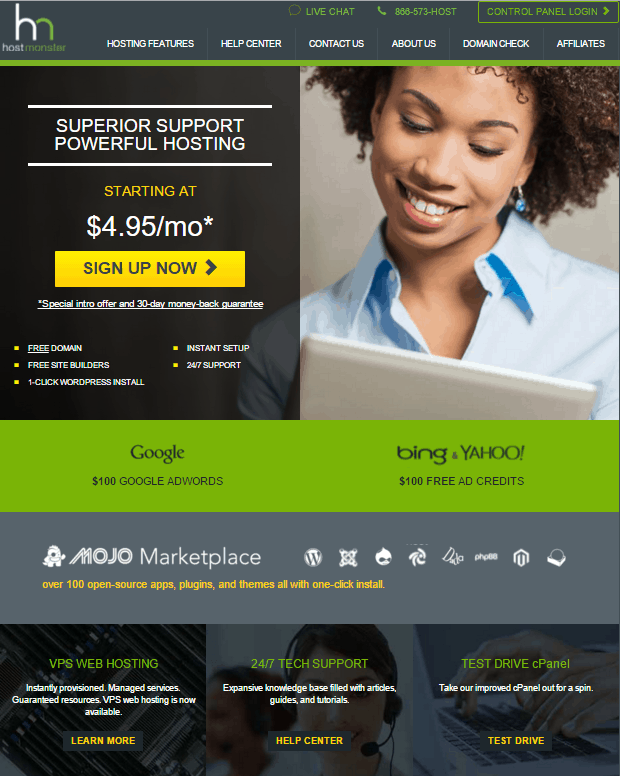 Up to this day, they continue to maintain a solid reputation by providing top-notch customer support and decent web hosting services. HostMonster is well known among individuals and small business owners who are on the looking for budget web hosting services. Their offerings revolve around a simple package where clients have the option to upgrade and add extra features whenever needed. Before anything else, it’s worth noting that HostMonster does not have a month-to-month web hosting option, which means you’ll be required to sign up for an annual plan. If you sign up for a two- or three-year plan, you’ll get to save more money along the way. If you think you don’t want to be tied with lengthy commitments like this one, consider investing on other web hosts that offer monthly payment options, like eHost and iPage. With prices ranging from $4.95/month to $14.95/month, you can choose from 3 different shared hosting packages: Basic, Plus, and Pro. At present, HostMonster does not offer Windows hosting, and I am not aware of any upcoming plans by the company to launch hosting plans on Windows 2003 or 2008 servers. They are a web host that exclusively provides Linux hosting. Most applications run perfectly well on the Linux platform but if you really need to transfer or build a website on an ASP.NET framework, then you’ll definitely need Windows hosting, which is available in other web hosts. HostMonster’s Linux-based Basic hosting plan includes a free domain that you can keep as long as you use their hosting platform, as well as free domain transfer, 50 GB disk space, unmetered bandwidth, and the ability to host a single website. For the Plus plan, you’ll get unlimited disk space and domain hosting, as well as spam prevention. The high-tier plan – Pro – builds upon the Pro plan, but with unlimited emails, a dedicated IP, as well as a free SSL Certificate. It’s the best choice for businesses looking to build a more powerful website but are on a budget. HostMonster almost have the same offering as their sister company, BlueHost. However, BlueHost offer plenty more hosting options and at more affordable rates (about $1 cheaper). And again, HostMonster does not support the Windows framework so if you need one, it’s best to point your web project elsewhere. If you’ve outgrown your shared hosting plan and you need the option to dynamically increase server resources, it’s time to upgrade to VPS hosting. It’s powerful, there’s plenty of room for growth, and it’s far less expensive than dedicated web hosting, too! HostMonster have 4 solid Linux-based VPS hosting plans (Standard, Enhanced, Premium, and Ultimate), starting at just $14.99 a month. That’s pretty cheap for a VPS hosting plan, right? Well, that’s because they currently have a limited-time 50% discount on all their VPS plans! This discount is based on the one-month subscription rate, and will automatically be applied once your order, regardless of whether you choose a monthly or annual plan. You don’t need to enter a promo code or do the math because HostMonster will do it for you. Pretty convenient, right? HostMonster’s VPS plans are built on powerful cloud technology so you can get more features and power as your site grows. And with each VPS plan, you’ll have access to their enhanced cPanel environment with a much better interface and a richer feature set compared to the competition. 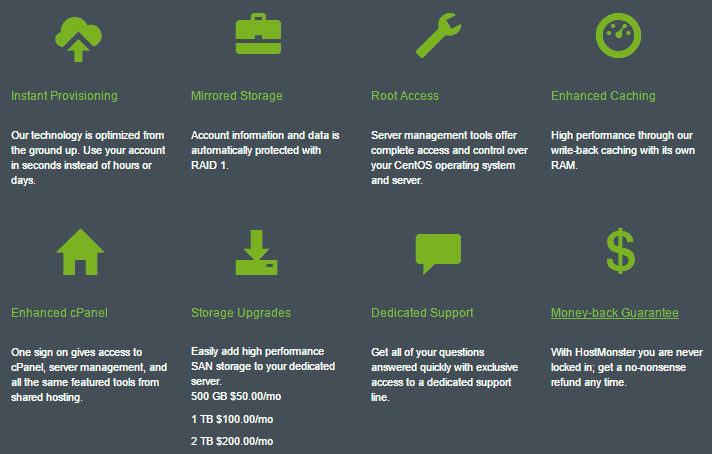 HostMonster’s VPS hosting plans are simple and straightforward, but are value-packed with the features and options you need and use the most. Their offerings are on-par with other top names in the industry, with reasonable prices that won’t break the bank. At this point, there’s just no stopping to your business’ growth. And for that, you need the most powerful hosting solution a web host could ever have – dedicated server hosting! HostMonster don’t cut corners with their dedicated servers. They’re custom-built with the best components and software, including top-of-the-line Intel Xeon processors and high-grade CentOS. And to ensure continuous upgrades and ehancements, they even use advanced cloud technology like KVM and OpenStack. Backed with these industry-grade technologies, the sky’s the limit to your business and website’s growth! You can choose from 3 different dedicated hosting plans: Standard, Enhanced, and Premium. HostMonster is currently offering a special one-time 50% discount on all their dedicated hosting plans, with prices now ranging from just $74.99/month to $124.99/month! 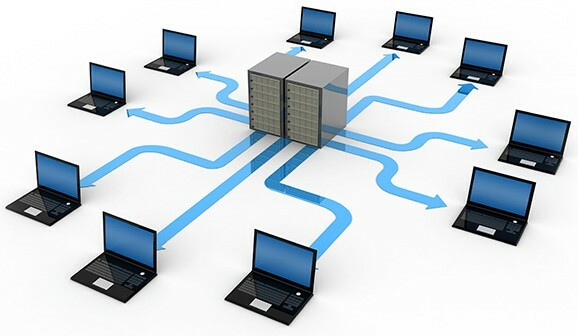 Looking at HostMonster’s dedicated hosting plans, you have a variety of configurations to choose from. The dedicated server is outfitted with a Linux OS; with plenty of disk space, bandwidth, and RAM. Those are pretty solid numbers, and they’re right on-par with many of today’s industry-leading web hosts. Overall, HostMonster’s web hosting packages get the job done right and fast, but with a few changes down the road, you might find yourself in need of an upgrade. They’re an “unlimited everything” type of hosting service, but there are, in fact, limits that might make things a little tight as your website and business grows. The primary caveat to HostMonster’s otherwise well-tailored plans is that there are a few missing key features. The database restriction could also become a serious problem if you’re running a large website. So before jumping aboard, make sure to evaluate your needs first. Other than these, I found HostMonster to be fully scalable. Their system is secure have the peace of mind knowing that your site is kept safe from suspicious parties who might get their hands on sensitive information. Do you have an existing WordPress-based website? Planning to create one using the industry’s most popular and most powerful content management system (CMS)? You really can’t go wrong with WordPress! It’s backed by a huge community of web developers, and you’re spoiled for choice with beautiful themes and plugins of all types and purposes. The good news is that you can easily migrate or create a WordPress website or blog with HostMonster. Starting at $6.95 per month with an annual contract, Hostmonster offer WordPress hosting and a simple WordPress setup. You can easily do this by logging in to your cPanel, navigating to the “MOJO Marketplace”, and clicking the “One-Click Installs” icon. From there, you’ll find a hundreds of applications that you can install, including WordPress. Choose the WordPress icon, and then click the “Install” button. Once you’re done, it’s up to you to choose the domain name you want to install it to. It’s that simple! The entire process of setting up a WordPress install on HostMonster is a lot easier compared to most hosting platforms. For example, web hosts like GoDaddy will first require you to delete a database before you can install WordPress. Yes, it may be easy to do, but those who are new to creating a website might find this intimidating. Unfortunately, HostMonster does not currently offer managed WordPress hosting plans. This means you need to manually install WordPress. If you wish to build a simple website, you can do so easily with the help of a handy drag-and-drop website builder which already comes included in their hosting plans. You can use this tool not just to build websites, but also for creating bulletin boards, blogs, as well as image galleries. For advanced users, you can also use the site builder for creating and designing complex sites and get it up and running in just a matter of minutes. HostMonster uses the popular cPanel website management software that’s known to be extremely user-friendly, allowing you to manage your site with just a few simple clicks. Users can directly access the control panel through their site’s homepage. You will be required to log in via cPanel for various administrative tasks. From the cPanel, you can easily access all of the features included in your hosting package, including the website analytics software, email autoresponders, and many other useful tools and options needed to successfully build a website. 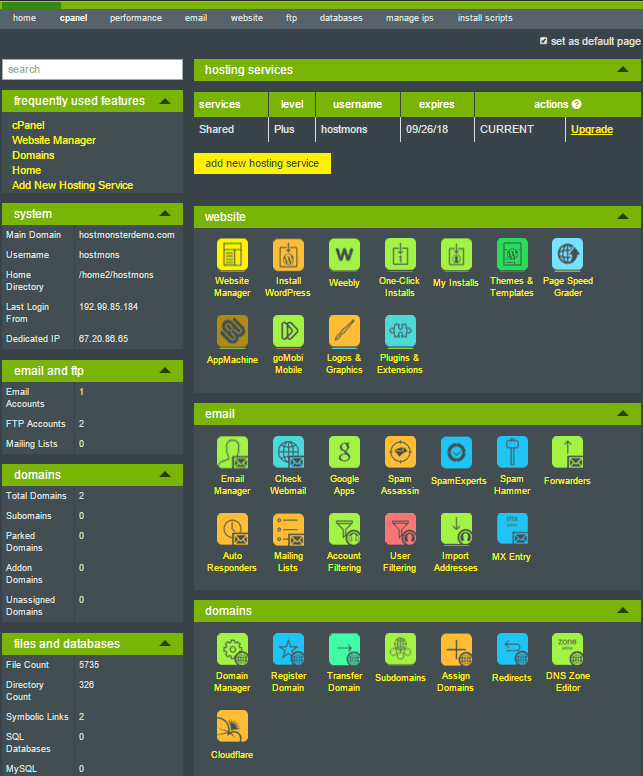 HostMonster’s cPanel is unlike any other cPanel you’ll see in most hosting providers. They have branded it with their own logo and theme, but with the standard features most web hosts offer. They’ve also integrated the SimpleScripts one-click installer which lets you install scripts and applications like WordPress, Joomla, Drupal, and 100+ more scripts that you can install on your site. I do prefer this auto-installer compared to other similar tools like Fantastico and Softaculous because it has an easy-to-use and visually appealing interface. Apart from this, HostMonster also provide a free web design tool and free online store scripts that make creating a simple eCommerce site easy and convenient. As always with my in-depth reviews, I monitor a web host’s server uptime and performance to ensure that you’ll get the reliability you deserve. 100% is definitely a good sign that can strengthen a web host’s reputation, backed up by a 99.9% uptime guarantee. In the case of many hosting companies, the alleged uptime is 99.9%, but there’s little to no evidence on offer to substantiate this claim. I went ahead and tested HostMonster’s server uptime and after a two-week monitoring period, I’m glad to say that there’s absolutely no downtime at all. As mentioned earlier, HostMonster uses the same data centers and servers as its sister company, BlueHost. This doesn’t mean, however, that you’ll only get half the power. In theory, this web host’s performance will be virtually similar as BlueHost’s. Any irregularities between these companies would most likely be caused from a specific server. Outages are very rare for HostMonster. To mitigate downtimes, the data center employs a balanced and synchronized power system that’s capable of sustaining the highest level of performance. What’s more, they’ve deployed an extra UPS backup power supply and 24/7 live system monitoring which ensures that disruption due to outage is kept to a minimum. They even have an automatic backup system that recovers any accidental data loss. The bottom line is that this web host has above average performance compared to many other popular web hosting companies. HostMonster’s refund policy is typical to what you’ll see with other hosting providers. 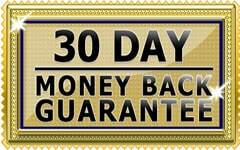 They provide a standard 30-day money-back guarantee should you decide your hosting account with them does not sufficiently meet your needs. With this, you can cancel at any time within the first 30 days of your hosting service. You can also receive a prorated refund for the remainder of your hosting term, should you cancel after 30 days. Take note, however, that if you register a domain with HostMonster, there will be a non-refundable domain fee which serves to cover their costs. This also ensures that you won’t lose your domain if you wish to transfer it after the required lock periods. Unless you decide to extend your contract, you get to retain ownership of your domain until the end of the registration period. If you wish to cancel your hosting account, there will be no hidden fees or penalties, so you’re free to point your website and/or domain elsewhere. A huge percentage of client complaints usually lie with the quality of a web hosting provider’s customer support. Luckily, HostMonster is one of those web hosts that are truly committed to providing quality service to their clients. So if you have a problem with your hosting account, you can get in touch with a customer representative through various methods, include US-based 24/7 telephone support and live chat. I tested both methods myself, and this is where HostMonster is able to one-up many other web hosts I’ve tested so far. I contacted telephone support at 10 AM on a weekday and asked about their shared hosting plans. After about 3 minutes, a customer rep picked up my call. The rep seemed quite friendly and was even able to answer my questions almost immediately. Overall, I was satisfied with his responses. I also fired up their live chat at 6 PM on a weekend to ask about how I could import my WordPress website into their hosting platform. A customer rep came to my aid 8 minutes later and pasted a couple of useful links that contained step-by-step instructions. The average wait time between responses was 5 minutes. Overall, my experience with their live chat feature was pleasant. So far, everyone that I’ve dealt with were professional and polite. They really did their best to fix my problems and answer my questions as quickly as possible. For additional help, HostMonster also have a ticket-based support system, as well as a knowledgebase filled with useful tutorials and guides. You may be able to find cheaper hosting in the market, but the level of dedicated HostMonster show to their clients is very impressive and falls right on the median. HostMonster received a solid A+ rating from Better Business Bureau. There are over 30 complaints filed against the company in the last couple of years, all of which were resolved. This goes to show that HostMonster really listen to their clients and do their best to solve issues right away. A lot of people stay away from web hosting providers because they think they need advanced knowledge and experience in coding to get their money’s worth. But having a website these days is very important, particularly if you are running a business. HostMonster is able to disprove this notion by gently ushering users into the World Wide Web. This web host may not look any different from other hosting companies that offer budget-friendly solutions, but the services on offer are all well-integrated and you’ll be provided with the necessary tools to get you started right away. The obvious advantage are their highly competitive rates which would surely appeal to many users. Another plus point is the reliability of their customer support services. Their staff are all based in the US which ensures that there’s no language barrier as all of them are native English speakers. If you’re the type who will need frequent technical support, this web host should definitely be under your radar. They can measure up with the top-ranking web hosts in the market. They’re reliable, reputable, and with a responsive and knowledgeable support system to boot. As you can tell from this review, I would definitely recommend HostMonster to my readers, especially to those who need budget-friendly and feature-packed hosting packages. It has all the things you’d expect from a great web host. So if you need top-notch hosting services, don’t be afraid of the monster –HostMonster is your friend. Before anything else, consider checking out other great alternatives first, including BlueHost, iPage, and eHost. These are top names in the web hosting industry, and they’re always known to provide reliable hosting plans at dirt-cheap prices. HostMonster makes it easy to create professional and fully functional websites, at a price that won’t break the bank. Hostmonster support will ask you for the last four characters in your password to verify your account. The implication of this is that your account passwords are stored in the clear either without any encryption or using a reversible encoding system. In other words, unacceptably insecure. If Hostmonster is hacked, and they could get hacked, your account password, all your files and all your data is compromised. This is important. If you run your business off your website, this could cost you your livelihood. + PROS: Reasonable prices, fairly versatile configuration.